"there was music in the cafes at night, revolution in the air"
Revolution in the air indeed, unfortunately for a few more years. The on-going Uranus waxing square to Pluto is the first major aspect following the conjunction of 1965-1966, another time of revolution and war. The last exact square aspect will be March 2015 but it's effects will be felt years afterwards. We should say before any cycle analysis, or any analysis, one should consider the effect of the possible Syrian conflict and the possibility of FED tapering, or not, being announced in the September meetings. 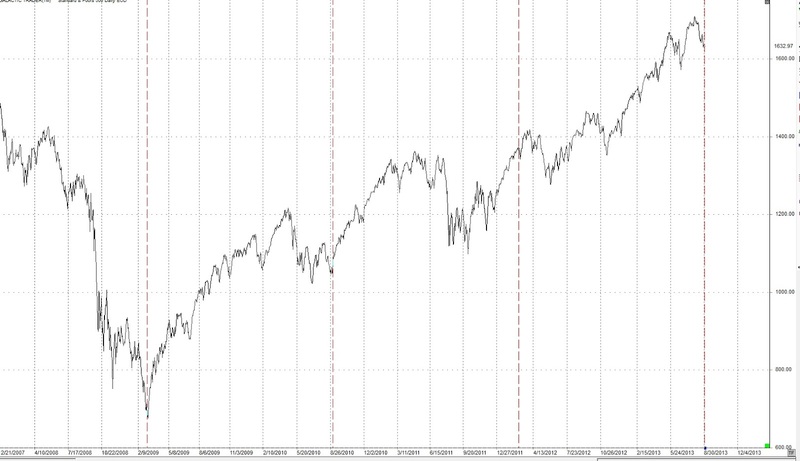 That said, I'm looking for the SP500 to move down at least early in September. I have the primary cycle at 20 weeks, therefore, overdue. It could be the 10th week but I'm working with the 20th week for now. Watch out for the market opening up on Tuesday and then quickly reverse. We've just had the Sun waning trine to Pluto on Sept 1st. This aspect has a history of strong moves both up and down. The first couple of weeks of Sept should be very volatile. We also have Neptune opposing Ceres on Sept 5 but the latter aspect has more of an effect on precious metals. The following week Mars is in waning square to Saturn. Not the aspect you want to see with rumours of war in the air. I may do a separate post on the Syrian conflict. The week starting Sept 9 does not look good for the citizens of Syria, at least the non-Alawite or non-Shiite ones. If there ever was a signature for chemical miss-use it would be Neptune and Hades. On Sept 12 Neptune will trine Hades. Hades is a Uranian point. This is a long term aspect and needs a window +- some number of days. It is obviously 1 day off the September 11 date. The universe is trying to send a message if the US attacks on September 11. There are two good markers for a move starting down. 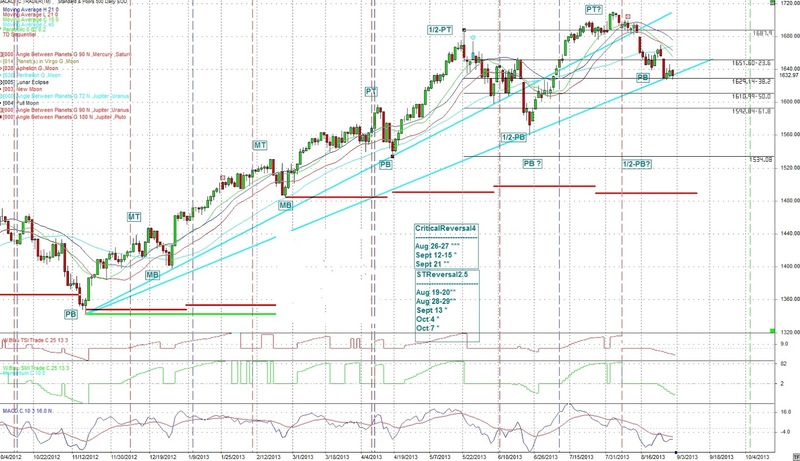 They are the trend line from October 2012 (light blue line) and the 38.2% fib retracement at 1629. If these are broken we may be looking below 1600 for support. 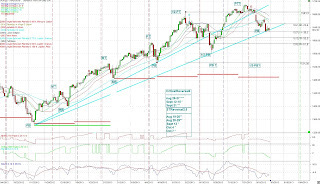 Also note on this chart, the 15 dma (green) has crossed the 45 dma (light blue) and is pointed down. 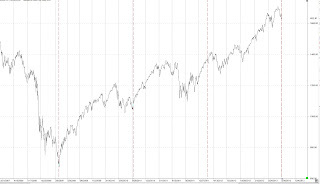 The next chart shows a 377 td that started at the March 2009 lows. 377 is a fib number. This looks like a possible s/t low. We are now getting into the Fall eclipse season with the Lunar eclipse on October 18 and the Solar eclipse on November 3rd. Planets aspecting the point of the eclipse can have an effect, sometimes a big one before and after the actual eclipse date. Monitoring activity around dates when planets or astrological points aspect the eclipse point can help determine the strength of the upcoming eclipse. Sept 7th Venus will be approx. 25 degrees in Libra, the point of the October 18 Lunar eclipse. Remember Solar eclipse are generally stronger than Lunar eclipses and will effect dates further into the future and the past. The above astrological dates were for geocentric aspects. When looking at heliocentric aspects we see Mars as more prevalent. Heliocentric Mars opposes Pluto on Sept 1. Heliocentric Mars trines Saturn on Sept 4. This should carry on past these dates when we look at the geocentric aspects. Heliocentric Venus translates the Uranus / Pluto square on Sept 13 and 14th. Watch Gold around Sept 13 as well. I'm looking for a big move in precious metals. Mars has entered Leo which often coincides with strong moves in Gold. This week on Sept 5th Neptune opposes Ceres, also a signature for strong moves in precious metals particularly Gold. Which way? Current events would point to Gold going up but I sense a down turn. We are in the 9th week of the primary cycle and the 4th week of the 2nd major cycle therefore due for a crest and down into the trough of the second Major over the next few weeks. 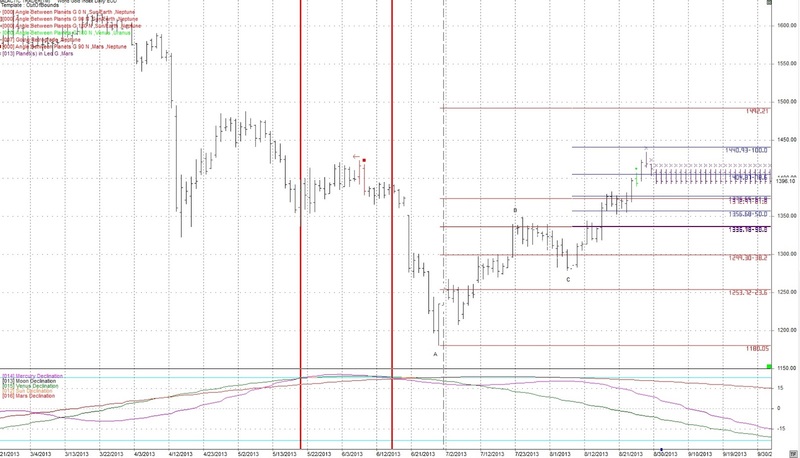 Watch the fib retracements on the following chart which is carried forward from 2 posts ago. 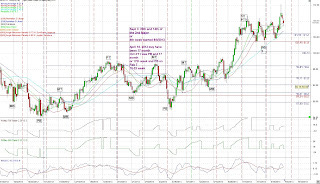 Crude is in the 20th week of it's primary cycle and therefore overdue. This will be stretched with potential war rumours and with the potential for oil delivery bottlenecks. 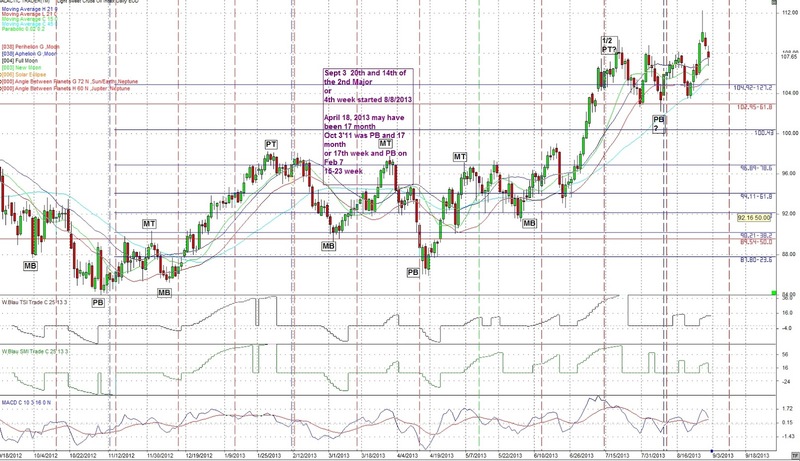 I'm looking for continued volatility in crude until the Syrian issue moves to the back burner. I assume Crude will remain elevated until the 3rd or 4th week of September.